‘Interlude’ was created when I was living in Coos Bay, Oregon, influenced by the special qualities of the northern US coastline. This print is numbered 3/250, printed on Epson Luster Paper (semi-gloss finish), hand signed and embellished with gold and variegated composition leaf. It measures 16 1/4″ x 12 1/4″. Click below to purchase using PayPal. The $120 charge includes packaging, insurance, shipping cost to anywhere in the continental United States and tax, if applicable. Only one print numbered 3/250 is available. Does NOT include mat or frame and will be sent rolled in a tube. 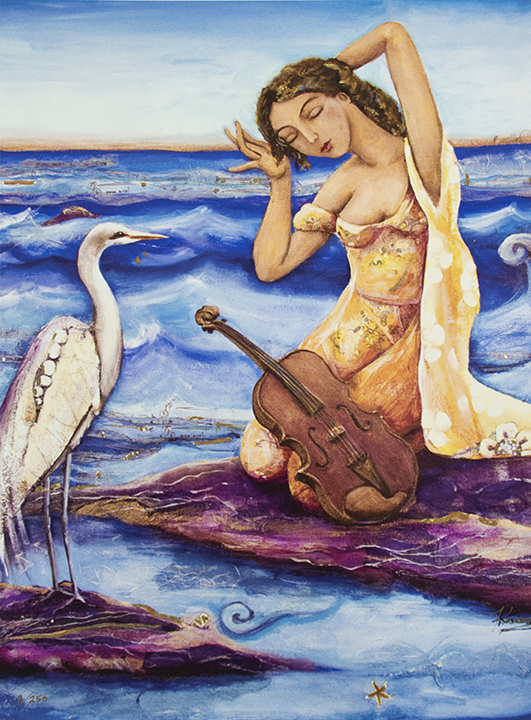 Chosen by the Oregon Coast Music Association, the original painting titled ‘Con Passion’ expresses the rocky and energetic feel of the Oregon Coast. The overall dimension of the poster is 20″ x 16″. The poster will be hand-signed at time of purchase. It is a poster and is not embellished with composition leaf nor does it come matted or framed. Click below to purchase using PayPal. The $50.00 charge includes packaging, insurance, shipping cost to anywhere in the continental United States and tax, if applicable.